These days, sugar doesn't get much good press. We have all heard about the negative effects of sugar and how consuming too much of it is potentially bad for us. In recent years, sugar has become public health enemy number one, and most people are trying to cut it down, and there are many good reasons for that. Many studies have shown that sugar is linked to many health related issues, such as obesity, diabetes and abnormal brain functions. We have all known for years, how bad it is for our teeth. It has also been linked to many health related issues, including obesity and some of the high risks diseases. But it is not just the inside that sugar can negatively affect us, it also believed to, age us and affect our skin. But cutting down on your sugar intake is not easy for many people, we have all grown up on sugary foods, and everybody loves the sweetened taste that sugar gives us. These days, sugar is in virtually everything, so no wonder it is hard to reduce it. Sugar tastes good, but it is not as good as being fit, toned, young looking and healthy. Trying to exercise your high intake of sugar off, isn't really the answer, as it takes hours of exercising to burn off one high in sugar food. The best way to avoid putting on excessive weight, is to limit or reduce your sugar intake. Sugar in small doses, isn't really a problem, the problem starts when you eat it in large doses, and over the years, each generations intake of sugar has gone up. The reason for this is, most of the nice and sweet tasting foods are high in sugar content, and the second hurdle to get over is, sugary foods can be totally addictive. So although we all know the negative effects of sugar, trying to cut it down can be extremely hard. When we are feeling stressed or emotionally overwhelmed, we seek something to give us pleasure, and sugar is one of those things that can give us instant pleasure. So if you're feeling depressed, frustrated stressed, bogged down, or you feel as life is getting on top of you, then your mind will seek out things that will take you away from your pain and give you pleasure. If you have a sweet tooth, then, sugar will probably be one of the easiest and quickest ways to give you a pleasure surge. Sugar can also provide us with energy, so again, when we are feeling a bit flat, tired or run down, we will seek out a sugary snack or drink to give us a boost of energy. Often these, energy boosts, will peak quickly and drop and the pleasure effect will be short lived. Therefore, there may be better ways to boost our energy, through getting plenty of rest and relaxation or eating high in nutritious foods. It is also a lot healthier to find better ways to deal with your stress and emotional issues. The less sugary foods you consume, the less you will crave for them, but if you’re trying to break your sugar habit. You can be left with a sugar craving and it has even been suggested, withdrawal type symptoms. "Dr Mark Hyman quotes sugar as a recreational drug"
Are you ready to lose weight naturally? 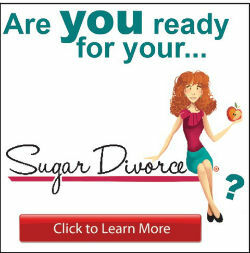 Learn more with a Sugar Divorce. Try today! These days we pretty much add sugar to anything and everything, and it goes with anything as well all the way from soup to cakes. This ingredient that can take a bland broken down dish and turn it into something special. Now I'm sure you might be saying at this point "yes. Yes, I've heard it all before we see it on TV, online and we are made aware of it by our doctors all the time." You see, most people out there I'm sure, are already well aware that high sugar consumption is not good for any of us when it comes to our health. But a lot of people out there don't actually know what it does to our body's, they don't know the negative effects that too much sugar may have on our health. Therefore, even though it's something they know isn't "good for them" it won't necessarily stop them from cutting back on their daily intake of sugar. But after doing just a little bit of digging and research you might be shocked at just how bad it can be for your looks and your body. Carolyn Hartz is one shining example of how you can benefit from reducing your sugar intake. Carolyn was once addicted to sweets. But she changed her lifestyle completely when she decided to go off sugar for good. And 28 years later, she looks fantastic, and even though she is now in her 70's, she could easily pass as a very fit 40 year old. Carolyn Hartz looks nothing like her age. It is amazing to think how she has managed to keep her addiction, whilst still maintaining a healthy and active lifestyle for so many years. Below is a list some of the possible negative effects of high sugar consumption, this evidence has been concluded by several books, researches and studies over the years. But even though everybody knows that excessive amounts of sugar is bad for you, because it tastes good and because it is addictive, it can be hard to reduce your sugar intake. It would be unfair to only put the bad points without putting the good points that would almost seem biased so here you go for all those out there wanting to know the health benefits of sugar! Sugar can make foods taste nicer, but when it is taken in high amounts frequently on a weekly basis can prove to be very addictive. Some reports suggest, sugar may be as addictive as cocaine. In an experiment conducted with rats in which they were exposed and hooked on to both substances, the rats ended up favoring the sugar over the cocaine. If you're the type to walk past the sugar section of a supermarket and think "ooh just the one." Or if you crack open a tin of chocolates in front of the TV and you keep going and going until you've had nearly half the tin before you stop, as ridiculous as this sounds these can be signs that you are addicted to sugar. Now these signs might still sound quite normal and many of us at some point have probably done this, but it's all about how often you're doing this once a week ok, but two or three times a week that's the sign of it becoming a problem and an addiction. Sugar offers no nutritional value to our body, and it is often quoted as being classed as "empty calories." Because sugar lacks and nutritional value, eating too much sugar actually makes you feel hungry, therefore increasing the chance of you eating more and gaining weight. Reports have suggested that sugar causes an increase in belly fat. This does not mean to say you should never touch a grain of sugar again in your life, this would be near impossible in this day and age, what with sugar being in pretty much everything. Trying to totally cut out sugar, may not be a good thing, the trick is to learn how to control your sugar intake and look for healthier replacements. It all comes down to, moderation and self discipline, knowing how much sugar you are consuming each day. Remember to check the labels of food you are buying, and while this can seem like a choir and a pain at first. It can save you from far greater pain in later life, and potentially save you from serious health consequences. Now is as good a time as any to have a change of diet, and start living healthier whatever your current age and health status I hear people all the time saying "well I'm already 50 now, its to late for me to change." And that's completely the wrong mentality, it's never to late to change and start feeling all the health benefits of reducing your daily sugar intake and feeling all the benefits that come with it. But it certainly does help to start as young as possible, especially when it comes to your skin, weight and teeth. There are some marvelous examples out there of people who have massively reduced the effects of ageing by purely just cutting out sugar from their diet. After reviewing all the evidence, sugar may be something that should be used sparingly and not consumed in high daily doses. A soft drink for example, can contain up to 8 or 9 teaspoons of sugar, and you just have to be so mindful of this when going about your day by day life.